The technology, which carries photovoltaic solar panels at sea or in landlocked water basins, is expected to see significant growth over the next eight years due to the rising demand for reliable renewable power generation that does not use expensive real estate on terra firma. The world's largest ongoing floating solar panel project on the Yamakura Dam reservoir in Japan, has a generating capacity of 13.7MW. "The ability to mitigate land cost is expected to favor demand over the projected period," said the report, titled Floating Solar Panels Market Size & Trend Analysis. Most of the growth in the global floating solar market -- also known as Floatovoltaics -- will come from the nations deploying it, which include Japan, the UK, China and Brazil. Japan, in particular, is expected to lead the way for floating solar panels primarily because of the low availability of land coupled with limited natural resources. In 2015, Japan accounted for 75% of the floating solar market revenue. In addition, the industry is expected to grow substantially because of numerous plans sanctioned by the Japanese government. In addition, the growing need for electricity in the country is expected to push demand for floating solar plants over the next decade. Currently, there is less than 50MW of floating solar power installed globally, but that could double to 100MW this year, according to Benjamin Attia, a research analyst for Global Solar Markets at GTM Research. Floating photovoltaics (PV) technology has the advantage of increased albedo (or reflective power from the water's surface) and natural module cooling, which results in higher peak efficiency, Attia said. It also benefits from reduced leasing and permitting costs and non-invasive land use, "which can be a major factor in land-restricted markets like Japan and Taiwan. "However, concerns over long-term degradation and corrosion, costly corrective maintenance, and specialized mounting structures, pontoons, and anchors are not easily scalable and likely to inflate the project's balance of systems costs," Attia said in an email response to Computerworld. "I do expect floating PV demand to continue to rise, but mainly in specific use-case applications, such as land-restricted markets such as Japan and Taiwan, wastewater treatment plants, hydroelectric dams and pumped storage reservoirs, and perhaps marshland restoration projects, where they can provide protection against evaporation and algal blooms." Much more promising than the latter, Attia said, would be solar built atop canals, which is becoming increasingly common in Southeast Asia and India. "They provide many of the same advantages of floating PV projects while avoiding many of the long-term viability risks and cost adders that floating PV projects face," Attia said. The Indian National Hydro Power Corp. built this 10MW solar PV project over the Sardar Sarovar canal. The world's largest floating solar panel farm is currently the Yamakura Dam reservoir in Japan, which was completed in 2016 and has a generating capacity of 13.7MW. That plant is capable of powering more than 5,000 households. 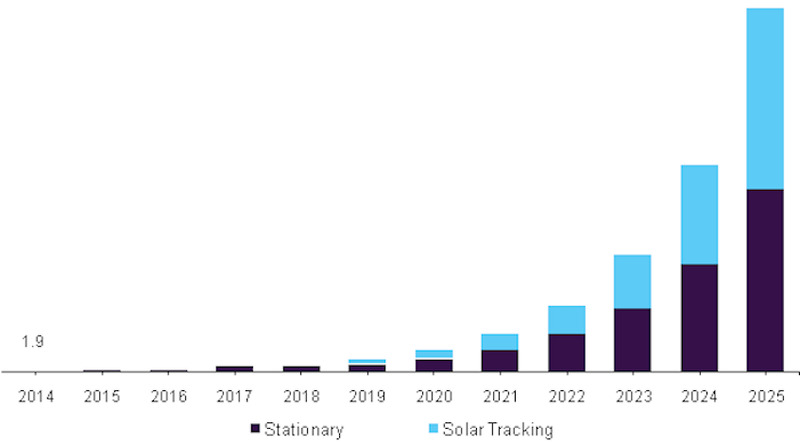 Japan's floating solar panels market revenue, by product, 2014 - 2025 (US dollars/million). Japan is expected to lead the market in deploying floating solar panels due to its lack of real estate and supportive government regulations. Europe is expected to account for the second-largest market based on the growing number of installations in the UK and France. The UK has the majority of the market share in Europe, with more than 10,000KW installed in 2015. "Opportunities on inland water will boost the demand for the Europe floating solar panels market during the forecast period. Latin America is expected to witness the highest growth owing to strong pipeline for solar floating plants," a separate report from Global Market Insights said. Europe’s largest floatovoltaics array is now being built atop the Queen Elizabeth II reservoir as part of Thames Water’s ambitious bid to self-generate a third of its own energy by 2020. Europe’s largest ever floating solar panel array is being installed on the Queen Elizabeth II reservoir. As part of an agreement among Thames Water, Ennoviga Solar and Lightsource Renewable Energy, the floatovoltaics project will include more than 23,000 solar panels atop the reservoir. The floating pontoon of solar panels is expected to cover about 9% of the reservoir. As floatovoltaics become more popular, market revenue is expected see a 50% combined annual growth rate from 2016 through 2020, according to a GM Insights' report issued in November. Floatovoltaics technology relies on water surface for panel installation and can be used atop reservoirs, ponds, lakes, canals and other stationary water bodies. Panels are adjusted to the position of sun, which can enhance efficiency and maximize output, according to GM Insights. "They also help to decrease algae growth in stable water and aid in reducing water evaporation through water bodies," GM Insights said. "As floating solar panels are placed above water it helps by its cooling effect and to maintain steady temperature of silicon panels, to continue output level...."
In addition to government subsidies and tax benefits, rent garnered from floatovoltaics also benefits those who own landlocked waterways, such as reservoirs and lakes. The global floating solar panel market by region. Not everything, however, is sunny for the emerging market. High installation and maintenance costs could put a damper on growth. In addition, floating panels cannot easily be placed in seas or oceans since waves could affect their positioning, which would affect electricity generation. Key players in the industry include Kyocera Corp., Trina Solar, Sharp Corp., and Yingli Solar. Ciel & Terre is expected to be the largest installer of floating panels across the globe; it accounts for more than half of the overall floating panels installations. "The rapid depletion of fossil fuel reserves has created a need for the utilization of renewable sources of electricity generation. Solar power is one of the fastest growing renewable energy technology owing to the ease in system installation as well as abundant sunlight across the globe," the Grand View Research report said. "Advantages related to the installation of floating panels as compared to conventional plants are expected to drive growth."